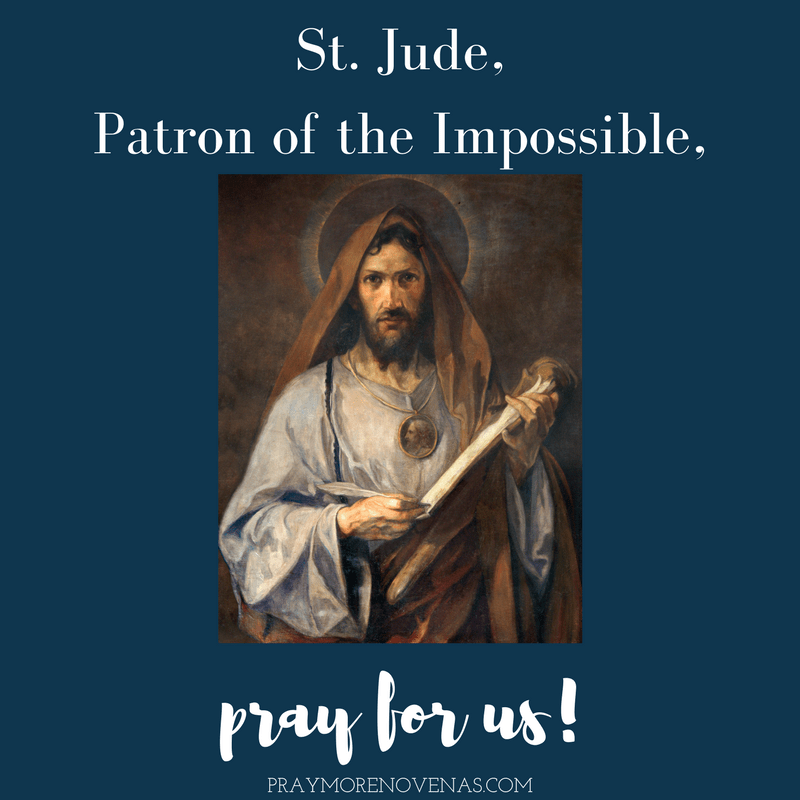 Our next novena is to a saint who does the impossible. In fact, that’s what he’s known for… answering impossible prayers! We will start praying the St. Jude Novena on Friday, October 19th! You can share your prayer intentions with us all below in the comments, and we will pray for you. Dear St. Jude, I humbly pray for our oldest son that he will be successful in his job, please bless him with a nice Christian lady to be his soul mate, please bless him that his faith will grow daily. I pray St. Jude PLEASE bless our middle son with a good job that he so urgently needs/deserves, please bless him that he will continue to visit the counselor for his depression, please bless him with a clear mind/positivity/responsibility. Please bless our daughter that she is successful in her job, please heal her pituitary tumor, so that she will be able to have children. Thank you for blessing her with her fiancé. St. Jude please bless my marriage that it will grow in faith and love daily. Thank you for all that you have blessed us with. We love you and adore you. Dear Lord Jesus Christ, Mary Mother of God and All the Saints I humbly pray for our 3 adult children that our oldest son will be successful in his job, and be blessed with a nice Christian lady friend to love him, and that his faith will grow and lead him back to the church. For our middle son-PLEASE wrap your arms around him as he is so lost right now, and may he continue to seek counseling for his depression/anxiety, and PLEASE help him find a good job real soon, and too be blessed with a nice Christian lady to be his soul mate. For our daughter that she will be successful in her job, that this medicine she is on will heal her tumor and she will be in good health, and thank you for blessing her with her new fiancé, that he will treat her with love and respect. I pray for my marriage that it will grow in faith and love daily and we Thank you for all that you have blessed us with. We adore you, and will continue to pray daily throughout this lenton season. Amen. Dear St. Jude, Our Lord Jesus Christ, and all the Saints. Please, Please help our middle son that he may continue to seek counseling for his depression/anxiety; PLEASE wrap your loving arms around him as he is lost, and needs guidance for a good job soon, and I pray that he will be confident, clear minded-responsible. I pray too for our oldest son that he will be successful in his job, and that he will be blessed with a nice Christian lady to be his soul mate, and that his faith will grow. I pray for our daughter that this medicine she is taking will heal her pituitary tumor, that she will be successful in her job, and thank you for blessing her with her new fiancé, that he may treat her with kindness and respect. I pray for my marriage that it will grow in faith and love. I thank you for all that you have blessed us with, and will continue to pray daily. Amen. A Novena for the deliverance of Israel from the evils of Benjamin Netanyahu and his monions. A Novena for the deliverance of our nation from the evils of Donald J. Trump and his monions. Holy Saint Jude please hear my prayers and pray for my relationship to heal with Ethan. Please bring him back to me so that I may love him the way that he deserves. Dear St. Joseph, Lord Jesus, Holy Mary, and all Saints – I pray to you for your urgent help with our middle son that he will be blessed with a good job; continue counseling for his depression, and be blessed with a nice young lady friend to share his life with. I pray for our oldest son that he too will be blessed with a nice Christian lady to be his soul mate, that he will be successful in his job, and that his faith will grow. I pray for our daughter that this medicine she is taking will take away the tumor, and she will be healthy, and successful in her job. Thank you for blessing her with her new fiancé. I pray for our marriage that we will grow in our love and faith. We thank you for all that you have blessed us with. We adore, trust and believe in you. Amen. St.Jude,please intercede for me..May I be completely healed from this infirmirty and have a healthy and happy life in the future with him. I ask for the conversion of my son Travis. Again I ask that you pray for him. He is struggling in his business and his life and his health. St Jude, friend of Jesus. Asking that my daughter get an offer for a job that she is qualified for, work with ethical people, and not too, too far from home so that she and her family can have a better life. She is a good responsible person who always does the right thing. St. Jude please grant us our request. ALso, listen to the others pleading for help. We put our trust in you, St. Jude. Dear St. Jude, the saint of the impossible, pray that the house gal i got today may live with us, to many it may seem impossible but through your prayers i know its possible. That you may also pray for my heath and that of my baby. Heavenly Father and Lord Jesus Christ please heal my sister JOYCE who is suffering from breast cancer. Radiation and chemo are over. Please pray that she be cured completely of this disease. Please hear our prayers Father and speak your words of healing and Mercy for my sister. Please pray for my other niece to get a good proposal. Praise and Thank you, Lord, Jesus, Mama Mary and St. Joseph. I want to thank all of you for keeping my sister in your prayers. Thanks and God Bless!! Dear Sisters and Brothers in Our Lord Jesus Christ, I ask you to pray the novena to St Jude with me. I am in a very difficult situation financially, albeit if my own making and I do take personal responsibility for it. I applied for large personal loan today so I can consolidate my debts into one, manageable loan. The bank official said it might be difficult to have the loan approved. He is going to let me know what the credit team approval answer tomorrow, 23 January. I am trying desperately to live the WILL of God more and more. I know I have to improve in all areas of my life, therefore I am completely surrendering myself to GOD, his son Jesus and Our Lady. I ask in Jesus’s name , through The intercession of St Jude and Our Mother Mary that this loan is granted swiftly and easily tomorrow, that I repay all my debts, stop spending irrationally, budget well and save for a house. I also ask for peace, health and harmony in my family. I pray for all your intentions also. God bless you all. I pray and I am claiming that my Work Schedule will not only return to normal early next week – the first full week of this month, the first month of this new year (January of 2019), but I will be working Full-Time with much higher Hourly Pay, and in My Promoted Desirable and pleasant Position now. Amen! Dear Lord, please grant Me Favor all over the difficult financial… Issues… I have been dealing with for several months now. I have claimed more than the Victory In Jesus’ Name; this Christmas Holiday Season is God’s Promise that my New Year’s Blessings Will Be Great things!!! Amen. I pray the USA Government will Not Shutdown at all! Amen. I pray for an end to any and all disorder that causes the USA Government to Shutdown. I claim the Victory of a USA Government that will not and does not Shutdown In Jesus’ Name Today! Lord please take and keep this Nation in Your Hands. Amen. Heavenly Father and Lord Jesus Christ please heal my sister JOYCE who is suffering from breast cancer and her daughter who is suffering from hormonal imbalance is polycystic ovary syndrome ( PCOS). Her Blood reports have come normal. Please send the Holy Spirit to cure them. Radiation of my sister is going one. Please pray that she be healed completely from this disease. Please hear our prayers and grant Mercy and healing to my sister and her daughter. Please pray for my other niece to get a good proposal and my friend’s brother who is suffering from Gall Bladder infection. Praise and Thank you to God Our Father, Jesus Christ, Mama Mary and St. Joseph. Thanks and God Bless!! My mother has brain cancer. I don’t want to lose her. Love her so much. Please heal her.